The shotgun approach to selling is old school (and not in a good way). How many unsolicited emails/instant messages do you receive every day from someone you’ve never met trying to sell you something? How often do you buy from these people? For those who answer anything other than “never,” you’re definitely the exception to the rule. It’s not a huge revelation to admit that you’re interested in finding new clients. Most of us have the capacity and desire for more clients. Many of us spend quite a bit of money each month marketing to build awareness about our products/services. With that in mind, blindly targeting people who’ve never heard of you is a waste of time, energy and money if all you’re going to do is try to sell them. You’ve heard this from me before, people are savvy and they are skeptics. Do you really trust someone who sends you a message bragging about what an amazing product/service they offer that is going “to change your life or business?” You don’t. So why are you taking a shotgun approach to selling in your own business? If it doesn’t work for others, why in the heck would you think it’s going to work for you? In my work with my VIP clients, we discuss ways to grow their businesses. When a VIP client tells me about some new idea they’ve been working on to grow their business, I always ask them, ‘When’s the last time you or someone you know bought from a company using this same method?” When their answer is never, it’s time to rethink the idea. We know people buy from people they know, like, and trust. That means you’ve got to do the work. Building relationships are key to growing your business. Make a list of the last 5 to 10 ideal clients that bought from you. Track back to where and how you earned their business. Did you meet them at a networking meeting? Were they referred to you and if so, by whom? Where did the lead come from? Like attracts like so this is a great place to start. Make a list of the last 5 purchases you’ve made for your business. How did you decide on which person/company to buy from? How did you initially hear about their offering? How many times did you hear about it before making a buying decision? What if anything, prompted you to move forward in the decision making process? Start scheduling time on your calendar to actively build relationships and sell. Most people never make time for this and therefore their business is not growing. Remember, the relationship piece must come first. Once you understand the information above, you’ll have a better idea of where to focus your efforts. More than likely, you’ll realize that sending out mass emails, flyers, and messages to people who’ve never heard of you is a waste of your time. That’s not where your clients come from. 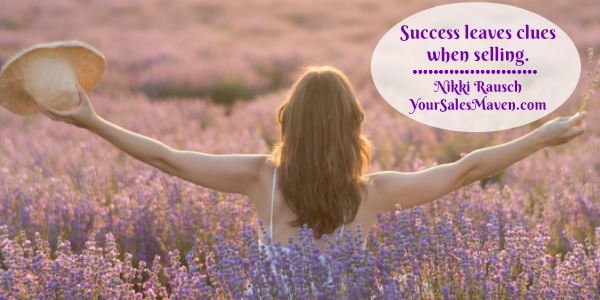 Success leaves clues so put a plan in place that replicates what’s actually working for you.